Anticipate potential volatility, identify dependencies, and get indicators that your release may be at risk. Leverage machine learning and predictive analytics to make informed decisions on an automated basis. Get a real-time view of your organization's intellectual property and who has access to what. Use the Sumo Logic App for JFrog Artifactory to gain a centralized overview of the artifact repositories and drill down on repositories to quickly identify recent changes, check application dependencies and identify potential issues. The Sumo Logic App for JFrog Artifactory provides a view of all the build information about how development teams are working. 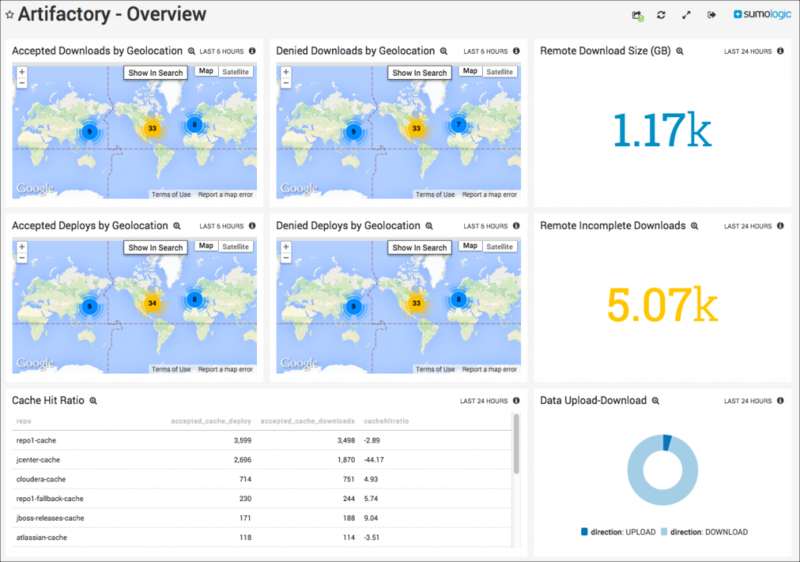 Gain insights into deployments by geolocation, IP address, or repository. 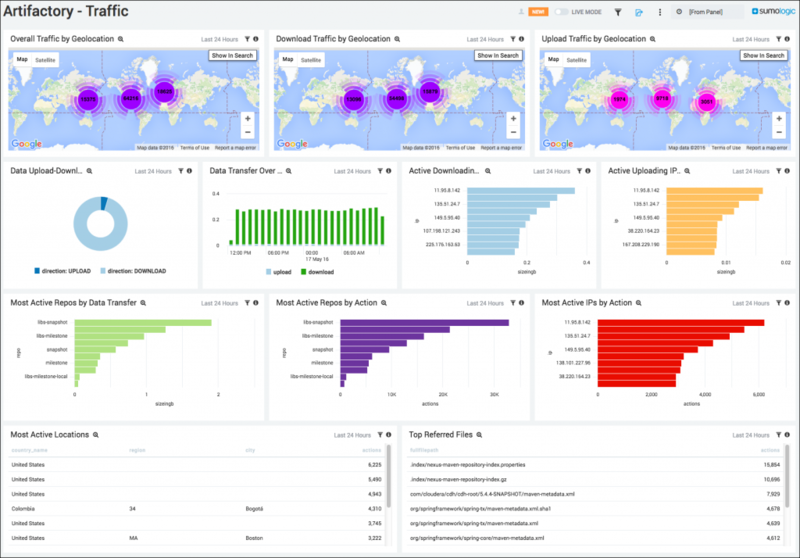 View overall traffic by geolocation, data transfer, most active IPs, etc. View requests and access, including requests by repo, status codes, denied requests, etc. 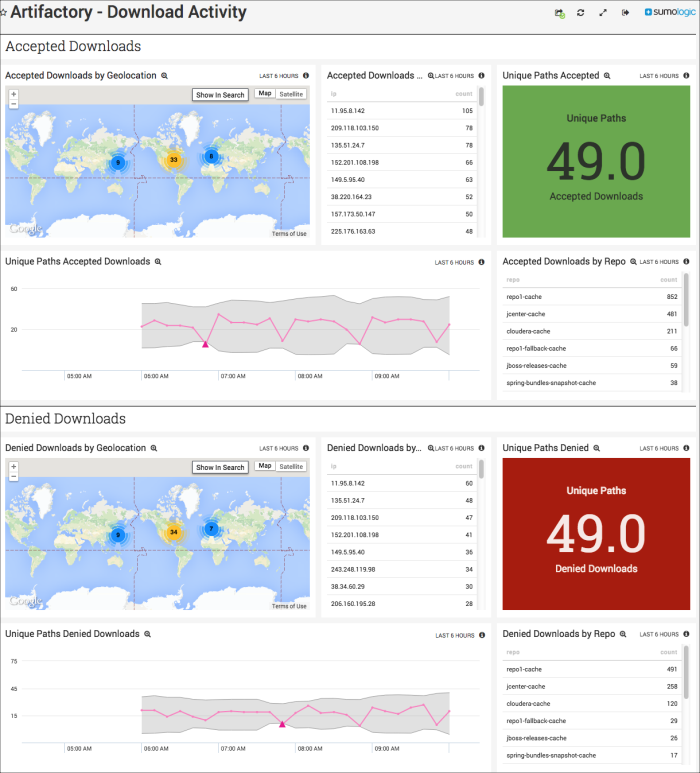 See download activity, including accepted and denied downloads by geolocation, IP, etc. Apply advanced analytics based on metadata and log data to make intelligent, automated decisions and prove that it’s a fit to make it into production. Modern security teams need real-time visibility into access and usage data in order to identify and neutralize threats before they impact the entire system. With the Sumo Logic App for Artifactory, you can view denied login requests and uploads by repository. Easy-to-use dashboards collect 5xx Status Codes and compile requests by status code every 10 minutes in a stacked column chart on a timeline for the last 24 hours. JFrog Artifactory and Sumo Logic integration gives enterprise developers and DevOps teams unprecedented insights into their software development operations as they build, run and secure modern applications. Sumo Logic and JFrog sit down to discuss this integration and how it helps JFrog users analyze data.